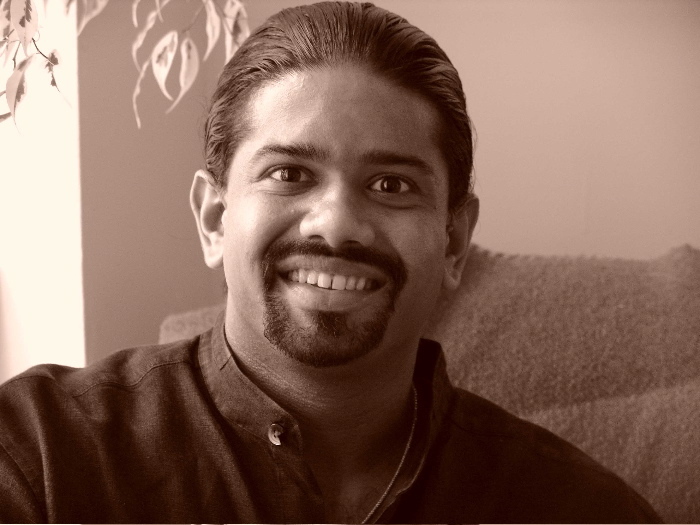 Vikas K. Menon is a poet and playwright whose poems have appeared or are forthcoming in publications such as burntdistrict, diode, and The Literary Review, among others. His poetry manuscript godflesh was a finalist for the 2010 Kinereth Gensler Award and a semifinalist for the Beatrice Hawley award, both from Alice James Books. His poetry has been featured in Indivisible: An Anthology of South Asian American Poetry and is forthcoming in The HarperCollins Book of English Poetry by Indians. He is a board member of Kundiman, the first organization of its kind dedicated to supporting Asian-American poetry and is the Resident Playwright of Ruffled Feathers Theater company. For APIA Heritage Month 2012, we are revisiting our Process Profile series, in which contemporary Asian American poets discuss their craft, focusing on their process for a single poem from inception to publication. This year, we’ve asked several Lantern Review contributors to discuss their process for composing a poem that we’ve published. In this installment, Vikas K. Menon discusses his poem “Othertongue,” which appeared in Issue 3 of Lantern Review. My writing process is both fitful and fickle: at the beginning of a writing session, I tend to move quickly among drafts to see which pieces pull me into further play. This method has allowed me to elude the blocks that used to plague my writing life. “Other Tongue” started in quick sketches; in this case, with a freewrite about my struggles with my parents’ ancestral tongue, Malayalam. Malayalam is a Dravidian language that is outside of the Indo-European family of languages, and it is primarily spoken in the South Indian state of Kerala. While I can comprehend Malayalam when it is spoken colloquially, I am otherwise illiterate in the language. Since it was the language of intimacy used by my elders during my childhood, I am ashamed by my inability to speak it fluently. But I can still revel in its aural pleasures and rolling cadences, its stark contrasts with English. So I began writing into the texture of it, exploring the strangeness of its syllables in my mouth. At the same time, I was working on a separate poem that explored my mother’s English, which is heavily inflected by Malayalam. Finally, I realized that the two poems were linked by their exploration of the difficulties of articulation. Despite that theme, paradoxically, the poem works quite well at readings: there is initial laughter at my mother’s malapropism that quickly turns to silent discomfort. I like that sudden turn, something the poet and performer Regie Cabico does beautifully. Previous Post LR News: Happy APIA Heritage Month!